Sandeep is working in a corporate company and he is very sincere in his work. The day before the month end he have a lot of work. So, he needs to stretch his time. Everyone left as they completed their work. Even security also left and he did not check the office properly and closed it. But still Sandeep is working in the office. After he completed the work he got shocked that the office is closed and he got locked inside. 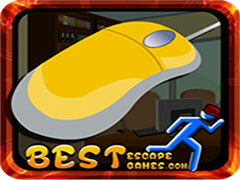 Now you have to find out the objects and solve the puzzles to escape him from the Work Place. Have fun and keep playing. Good Luck.